At 19.5 feet, Utahraptor is the biggest & first known member of Deinonychosauria, similar in more ways than any other Dromaeosaurid to early Troodontids. The only proper specimen consists of claws from the feet & hands, leg bones, a partial skull & a few tailbones, but we can assume it was a formidable predator; differing from the established Deinonychus in size & little else. 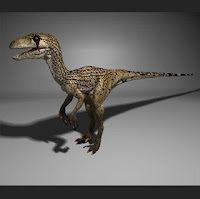 Utahraptor stands out from the rest of its family in that it was not a lithe & fast animal compared to its cousins. The leg bones are twice as thick as the larger Allosaurus, which can range from 25 to 39 feet. This suggests the legs were built for strength more than speed, which means Utahraptor probably stalked its prey. It also weighed 1,500 pounds or nearly 700 kg, helping it to bring down far larger prey than itself. During the filming of Jurassic Park, Steven Spielberg wanted to change the script the make his raptors 10 feet tall, but paleontological advisors told no such animals existed & so he stuck with Michael Crichton's smaller man-sized raptors. Soon after the film was released, Utahraptor was discovered which would have fitted Spielberg's giant raptor part well.